"If I'm in a foreign city I tell the story of the first time I ever went there or I say something charmingly naïve about the place, but if I try to say something about Toronto, it's like, okay, well, where do we start?" Tamara Lindeman asked a sold-out hometown crowd last night (November 24) at the Great Hall. "What stories do we have about Queen and Dovercourt? What stories do we have about Queen and Shaw? Queen and Crawford? We could be here a long time." An apt segue to "I Don't Know What to Say," the reflective bit of banter spoke to the impossible psychological gymnastics at play. Even for one of Toronto's most clear-eyed ramblers, distilling the histories of the world around you into a shred of conversation that connects with the present is work. 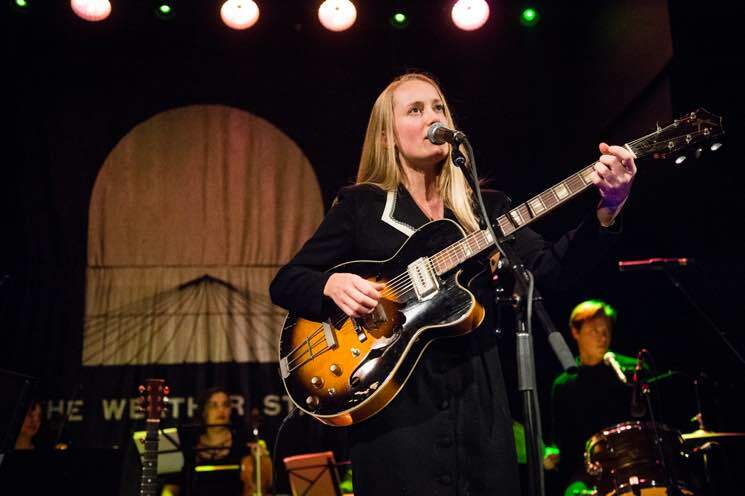 As the Weather Station, Lindeman's just devoted an entire album to the cause, diarizing on climate change, politics, her relationship with her partner and the dissolve of her parents' marriage with lucid, whirlwind lyric passages and newfound tempestuousness. So, it felt appropriate that in a set that clocked in at just over an hour, she let the new music do most of the talking. The songs on the Weather Station's self-titled fourth record are louder than ever before, and she's assembled a touring band that really brought them to life. Ryan Driver's flutes were missed, but with Constantines powerhouse Will Kidman on guitar and keys (and bongos! ), Ian Kehoe on drums, Ben Whitely on bass and a string quartet in the ranks, Lindeman's racing spoken-sung vocals unwound with majestic velocity over a newfound electricity, at times even coasting over rhythms and an atmosphere that courted a subtle post-punk rumble. Still, early fans were obliged with a loose and loyally hushed "Came So Easy" that proved trickier than suggested when a tickly throat caught up with Lindeman toward the end; she let out some coughs, then chuckles, no doubt fully aware of the irony. Despite keeping a beatific lightness to it all, the updated sound felt like a committed recalibration. "I'm a person who's played a lot of really, really quiet music that would not have worked in this context," Lindeman quipped in another aside. "And then something changed, and I found that I felt wrong writing quiet music because there's so much going on right now that makes me feel very not quiet."